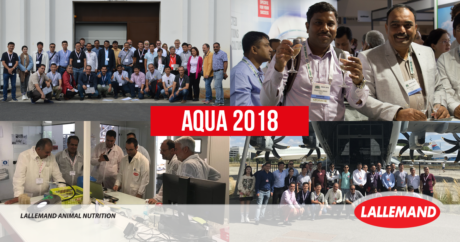 From August 27 to 30, at the occasion of the AQUA 2018 conference and trade show organized by the European Aquaculture Society (EAS) and the World Aquaculture Society (WAS) in Montpellier, Lallemand Animal Nutrition organized a technical tour in the South of France. We were pleased to welcome around 30 partners, consultants and governmental organization from key markets in Europe, Asia and Latin America for a week of technical and social exchanges around aquaculture and microorganisms. Following the conference, trade-show and visits to local fish farms, our guests could experience first-hand the passion of Lallemand for fermentation by visiting our bacteria plant in Saint Simon as well as R&D laboratory in Toulouse dedicated to process development. To illustrate with style the importance of microbial strain selection, our guests were invited to experience the specific impact of yeast strains on wine flavors during a wine tasting supported by our oenology colleagues. This week was an excellent opportunity to share technological knowledge to advance sustainable aquaculture and give an overview of Lallemand expertise in microbial research and production.